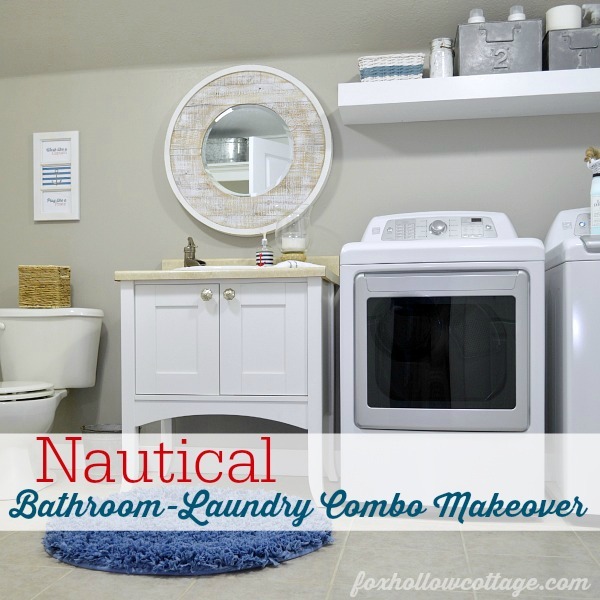 With a nod to nautical, we’ve got a new room to share here at the hollow. We all love it. It’s got the perfect bit of masculine and just enough cute for me. 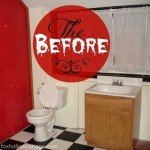 I was ready for a change so our striped accent wall went buh-bye. I know they are popular and I still like striped wall features, but mine was 10 years old, and I was ready for a different vibe in this room. 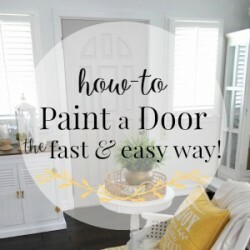 They say paint color can make the biggest impact on a room, and I am a firm believer. So, I got myself to painting. 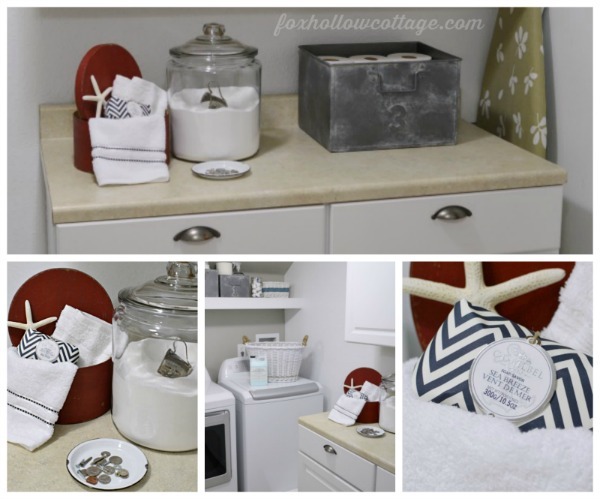 To help find a new color for the room, I used the ColorSnap® tool from Sherwin-Williams. 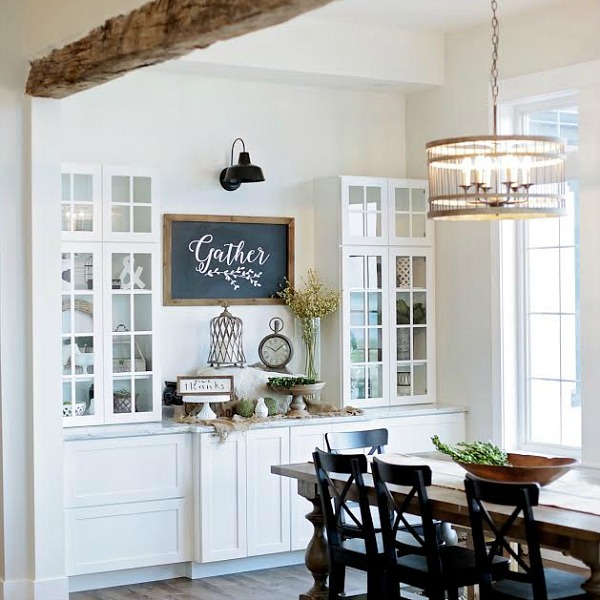 It’s really easy to use and quickly and easily matches images you capture with your smartphone to the palette of 1,500 Sherwin-Williams paint colors. It’s available for iPhone and Android devices and super fun to play with. I’ve been color snapping everything. 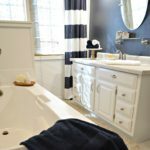 In my previous post I had touched on the fact that I wanted a grey, so I utilized ColorSnap® to pull a coordinating grey tone from my tile. I got the free app for my iPhone, snapped a pic of my existing floor tile and started seeing what colors it came up with. 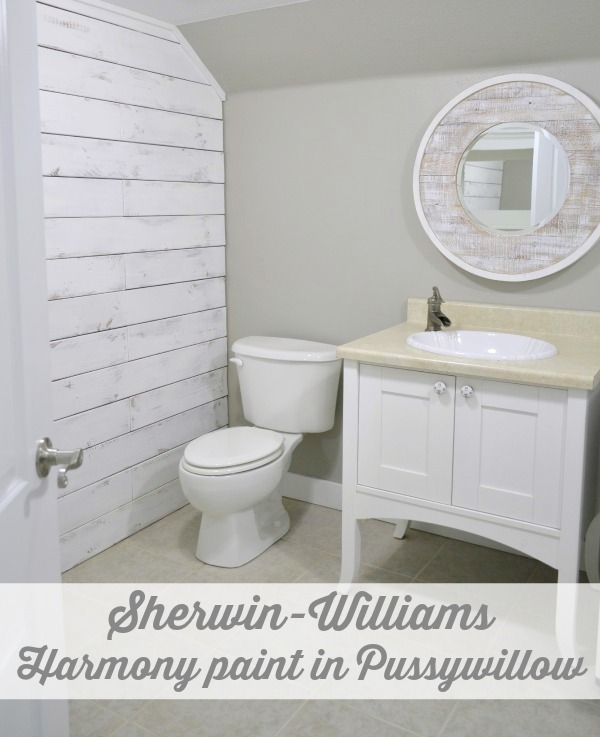 Meet Sherwin-Williams SW 7643 Pussywillow in Harmony® interior paint. I am in deep, deep like. I guess I should remind you what I started with. Don’t cringe too much okay? I told you it needed a refresher remember? It was Summertime when I did it too, so I’ll use that as an excuse. No wait. I had heatstroke. Yeah, that was it. Heatstroke. I think I’ll stick to that!! Now, back to my pretty new wall color. At the point that I painted, I still didn’t know what I wanted to do as far as accessories. Typical me. … and then, I met a soap dispenser and it all fell into place. I’m not a super-planny decorator. Something has to spark. Otherwise… it never works for me. 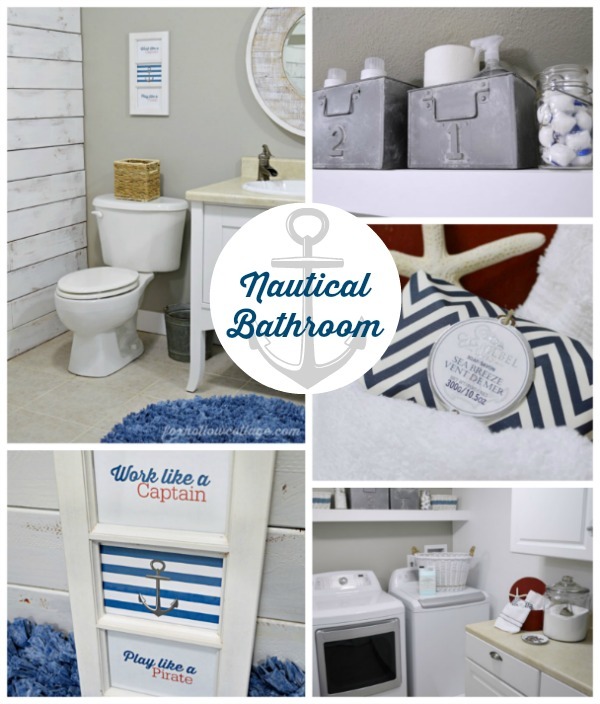 After my magical moment with the nautical, Navy QT, I was on a roll and I started finding little bits of this & that to complete the room. You know.. 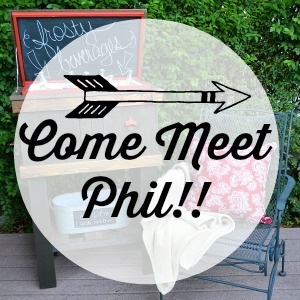 I blog a lot about silly fun things, and just because things, but when I get to work with BlogHer in collaboration with companies, it’s the best. A real cherry on top of my blogging Sundae. Getting the opportunity to work with a premier company like Sherwin-Williams is an honor. 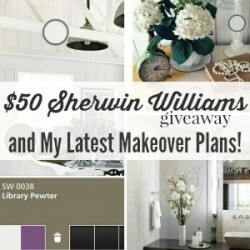 I was really happy when I found out I was getting to review the Sherwin-Williams Harmony® Paint line for two reasons. 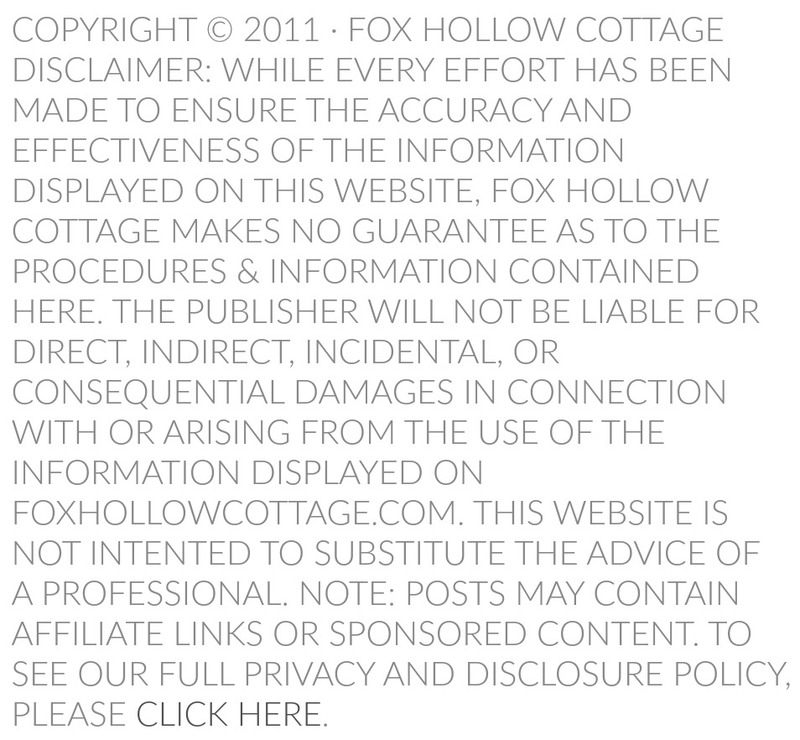 One, who doesn’t love a paint that has zero VOCs? I mean, the room I am working in does not have a single window, so this was a real blessing! 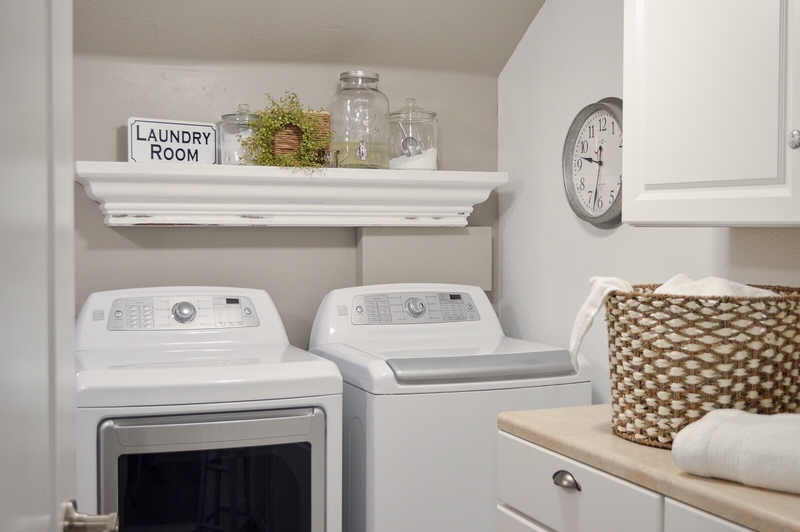 And two, the Harmony® acrylic paint is GreenGuard Indoor Air Quality Certified® – it actually helps reduce common indoor odors as well as helps to reduce VOC levels from potential sources like carpet and cabinets, to help rooms stay fresher, longer. Sounds good to me. Once my painting was done, it was time to decorate! 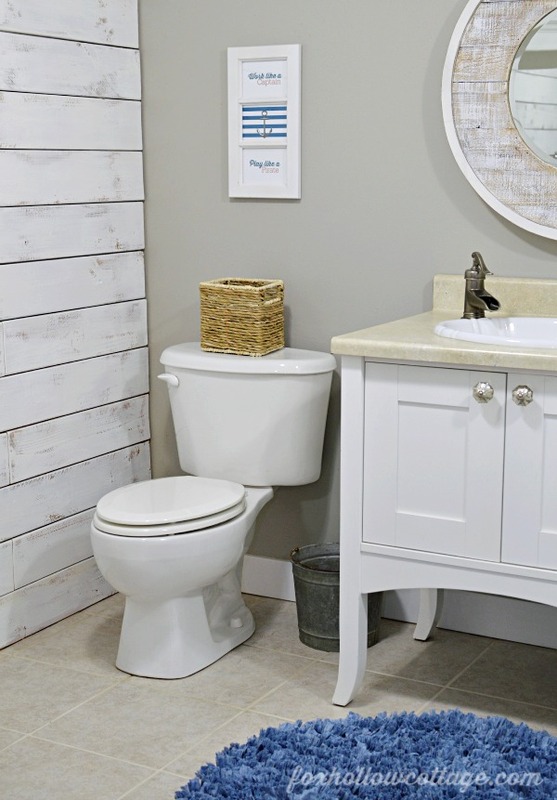 With an empty spot over the commode, I used an old frame I had on hand to fill it by creating and printing some art to fill the space for free. The extra bonus there being it’s the exact colors I wanted! You might have noticed that new feature over to the left? Yep. 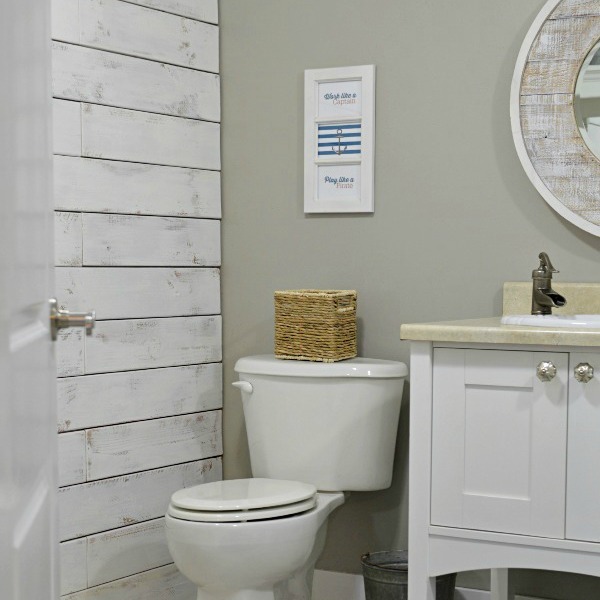 In addition to painting, we also added a few, fresh DIY projects like a wood wall. 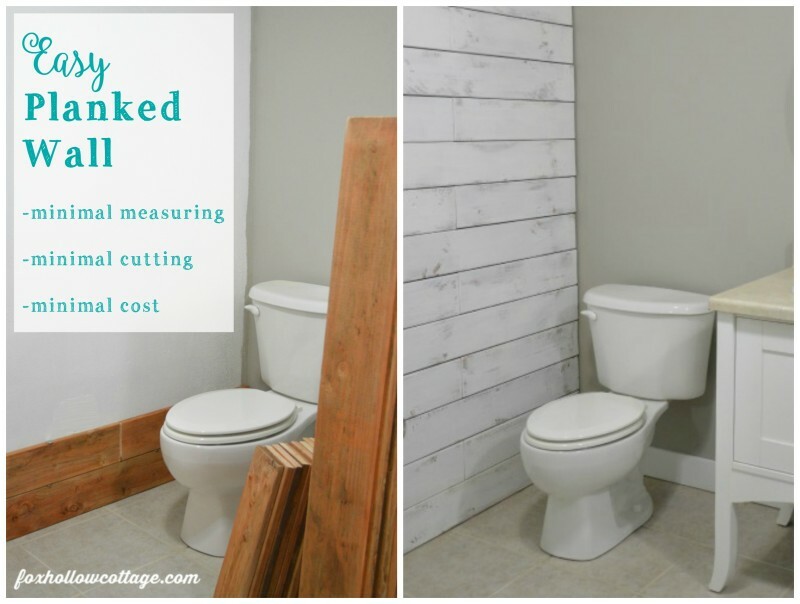 You can get the how-to details on easy & affordable planked wood wall by [clicking here]. I used the Harmony® paint on that as well. You know I like pure white and the wonderful Sherwin-Williams employee told me it would be spot-on straight from the can. He was so right. I am adoring the grey. My fav is the little peek under the vanity. Why? I have no idea… I just like it. 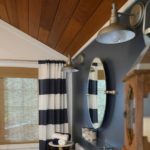 I am certain that when I tire of the nautical accents, this color will transition into another look for me effortlessly. Did you notice those new mercury glass beauties? I tried another style first, in fact, I shared them on facebook.. but remembered I had these and they won out! 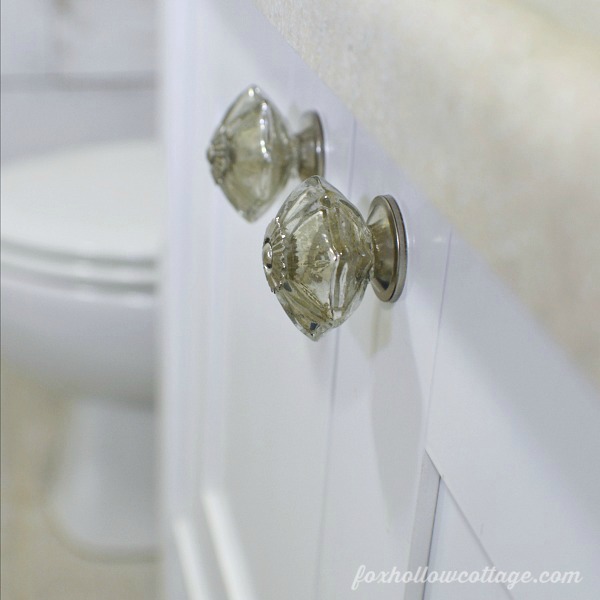 As part of the refresher, I made some easy changes like switching out cabinet hardware on the vanity and cabinets. There is a reason it’s a design tip staple. It really does make a subtle change in the room. Sort of like what earrings do for an outfit! 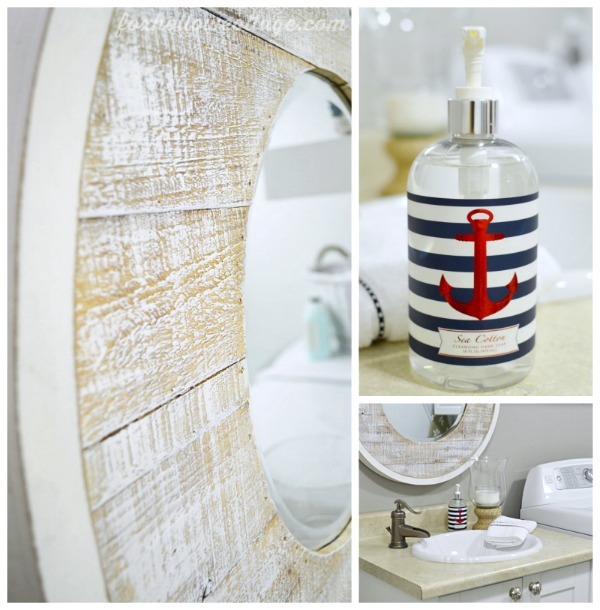 Our second DIY is the new floating shelf . 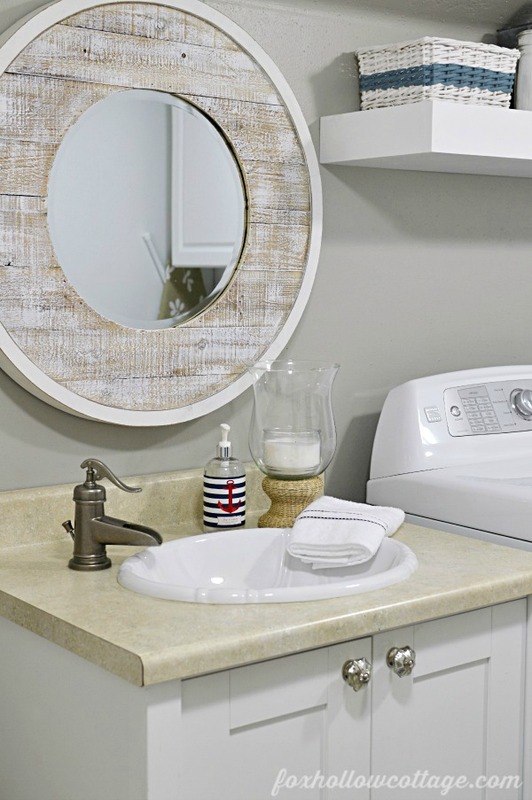 It offers a much more streamlined look than the upper cabinet we had previously, and it offers plenty of storage for all our everyday laundry essentials. 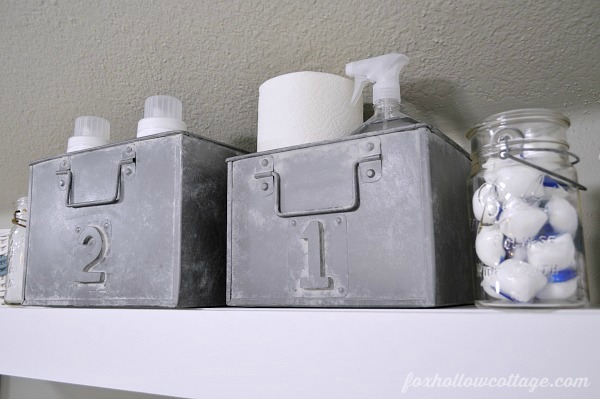 Plus, those faux zinc bins were calling for a cute shelf to live on! 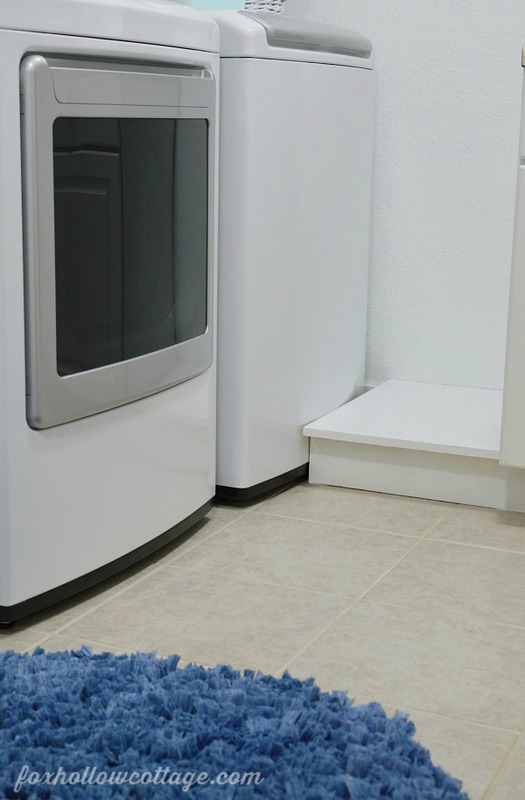 Jimmy built-in this wood step for me so I could reach down into the washer easier. 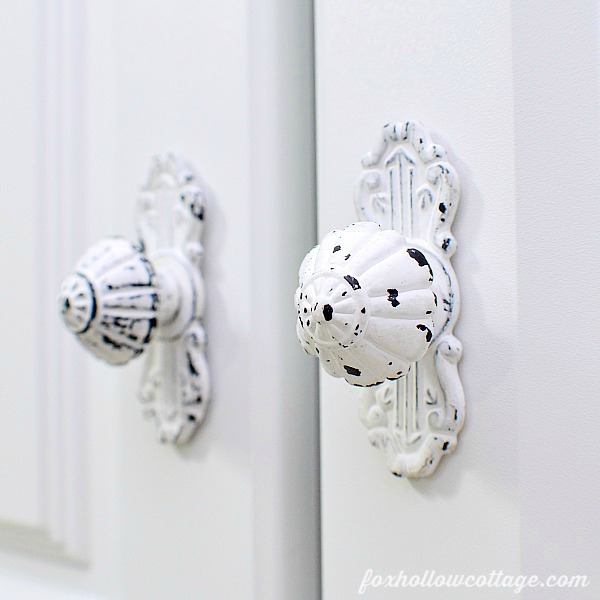 This room makeover prompted me to caulk, fill nail holes and paint it. Nothing like a nudge to get a project completed. It’s simple, does the job and I love it. No more tippy-toes for me! Sweeping over to the right side of the room, we have a set of upper and lower cabinets and a counter top area. Great storage and a super surface for folding. 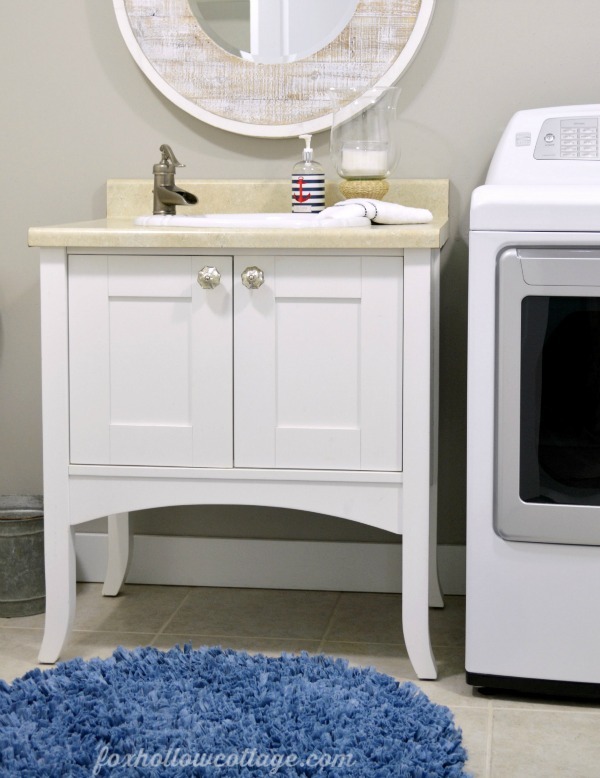 The glass jar of washing soda, the collection tray and the back stock TP will stay put. In all honesty, that cute hat box might have to find a new home. Maybe an additional shelf? 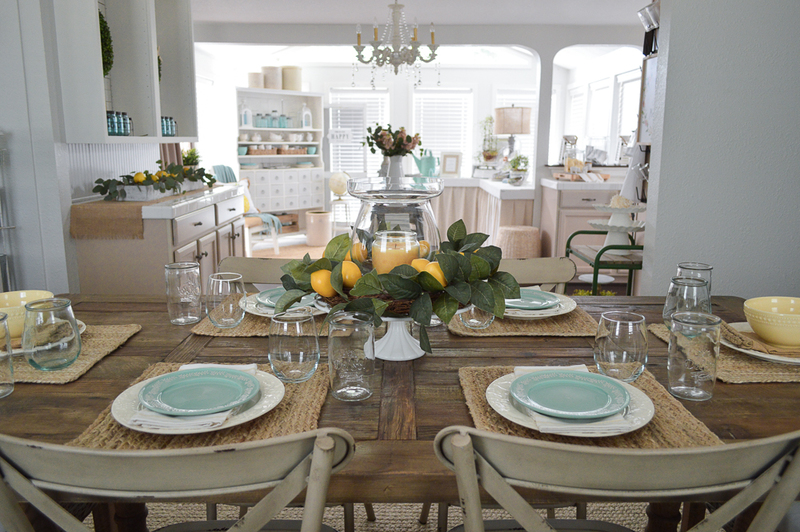 I love how it looks, but that is valuable counter top there so we shall see. 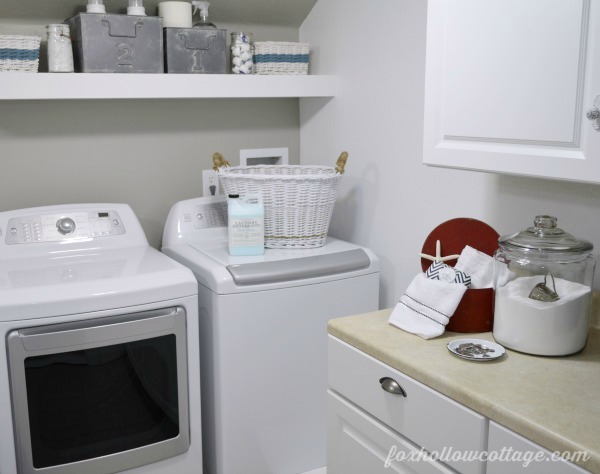 Do you have a collection plate in your laundry room? I make a killing. 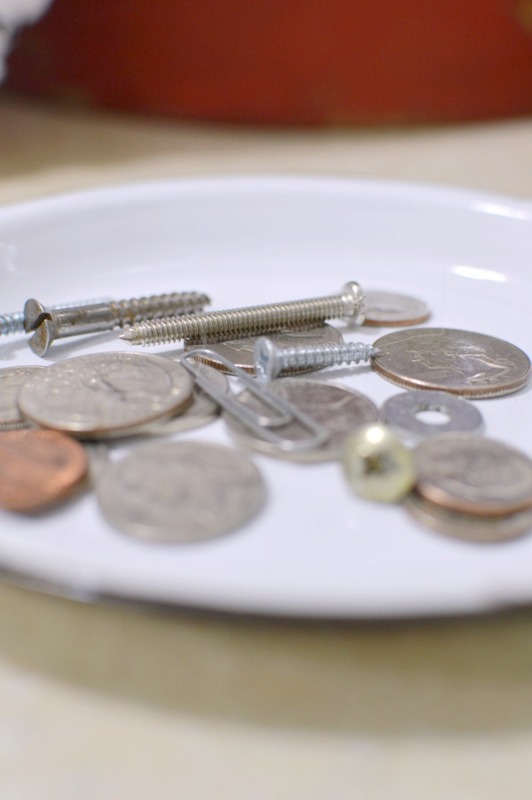 Lots of change gets added to my garage sale money from that little dish! I don’t find Legos any more though, and you know… I miss that. The new space feels so fresh and revived. The Pussywillow color was a great choice, and I’m so happy it’s not too dark. Actually, I’m amazed at how much brighter it is. With the white wood and white walls to balance it, it’s brighter now than it was before! 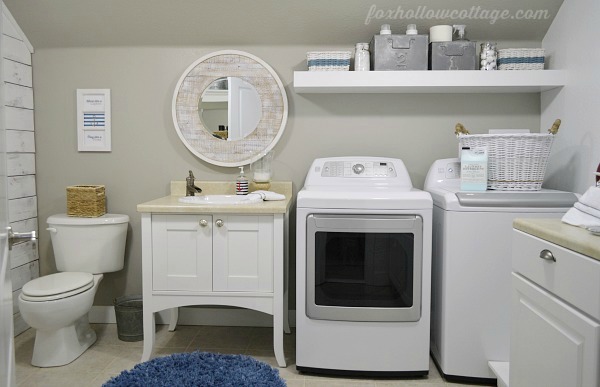 It sure was hard to wait to show you, and I hope you liked the look at our new laundry/half bath. Facebook, Twitter, Instagram, YouTube and on Pinterest too, where they share loads of inspiration. Love it, Shannon! It looks amazing! I’m loving your new (redo) room! 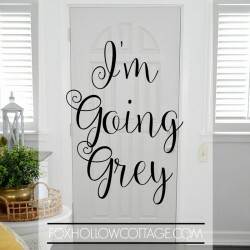 I would love to redo my living/dining room with new paint. It looks great, Shannon! 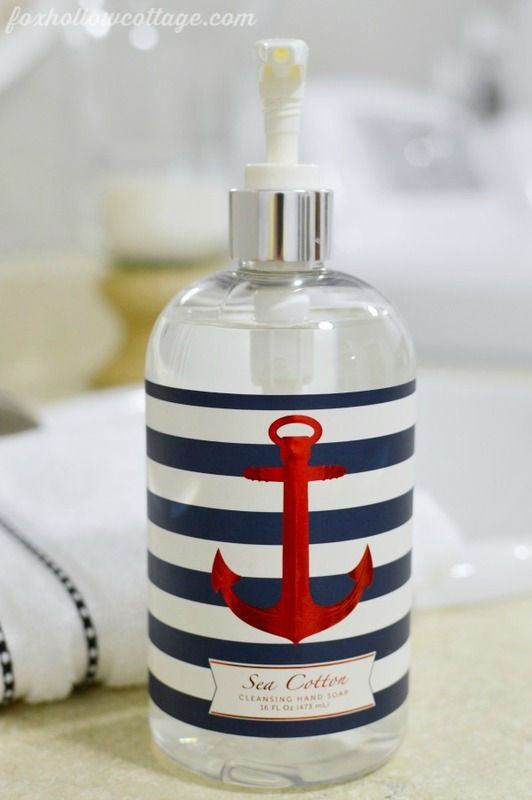 I love all things nautical. That wall is gorgeous!! 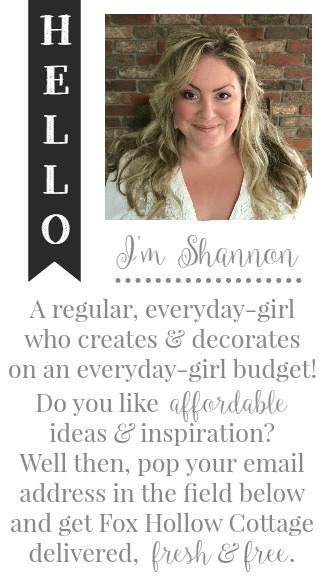 Beautiful makeover Shannon…LOVE your planked wall!! Looks fab! My favorite…. gotta be that wood wall. 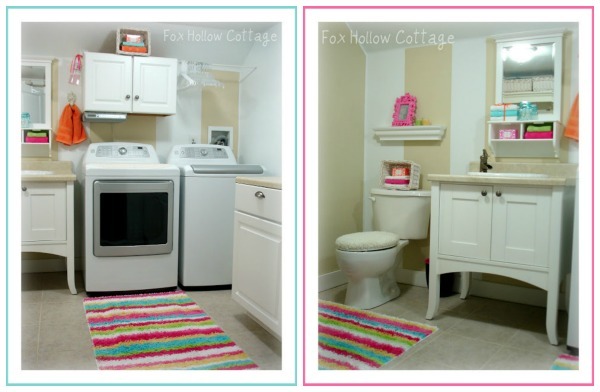 ♥ how your space turned out! As always you did good woman! 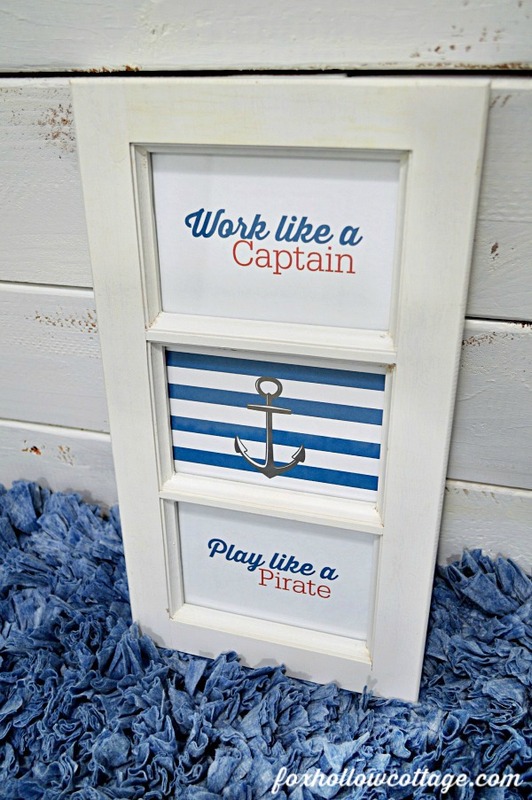 We are just about to re-do our son’s room so that is the next space that we will be paint’n. 🙂 xoxo Thanks for the giveaway. Beautiful room. 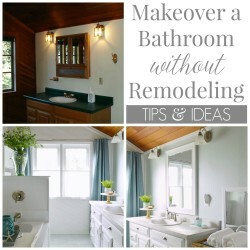 I need to do over my upstairs bathroom and my master bedroom which has never been done! Ugh! It is beautiful Shannon! 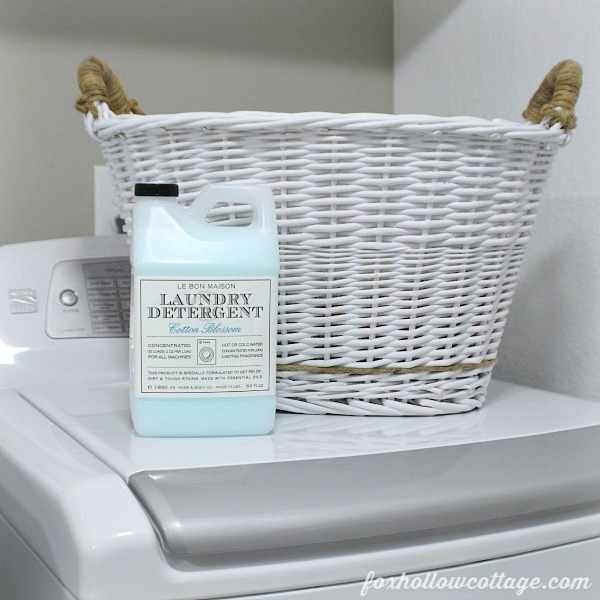 I love it all to even include your cute laundry detergent! Turned out beautiful. I love all your little details. The wall is amazing and the color is perfect! 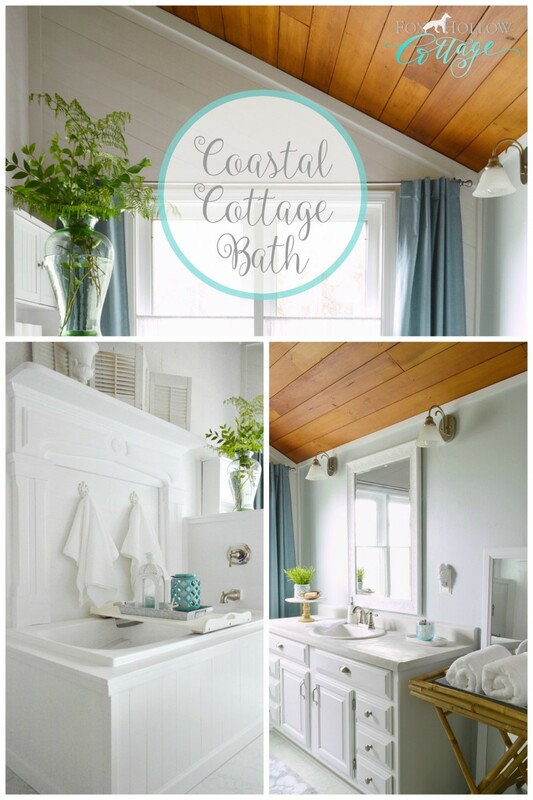 Nod To Nautical Bathroom Makeover | Diy Before & After w/ Affordable Wood Planked Shiplap Wall and Coastal Cottage Decor.